Why should I clean between my teeth? We get this question asked a lot. We grow up knowing the phrase brush twice a day every day, but not many know about why and how to clean in between our teeth. Having said that we have seen people pick food out of their teeth with tooth picks. But there are many more effective ways of removing food debris and plaque from teeth and under the gum line so let’s talk about that today. How do I clean between my teeth? All of us have heard about flossing, that’s just one way of cleaning between teeth, interdental brushes and oral irrigators are the other two. Dentists and hygienists don’t recommend using tooth picks because of the hard nature of wood which might traumatise your gums in the long run leaving unsightly gaps between your teeth. 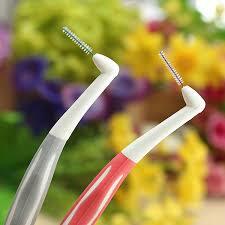 Interdental brushes In my humble opinion they are the best way and I always recommend them. They come in all sizes and shapes and it is important to use the correct size for effective cleaning. If the brush is too small it won’t remove all debris and on the other hand if it is too big it will splay and can hurt if you try to squeeze it through a smaller gap. Ask your dentist and hygienist about the best brand and size for your gums and teeth. You might have to use different ones in different parts of your mouth so be ready for that. Technique: hold the interdental brush between your thumb and forefinger. Gently place the brush through the gap between your teeth and move it back and forth like a mini bottle brush to remove bits from the teeth and gums. Wash the brush, they are reuseable for a few times and an investment which will save you loads of unwanted trips to the hygienist. If you have severely crowded teeth, overlapping teeth or tight spaces you might not be able to use interdental brushes between them, in that case use floss or tape. If that is not possible it is an indication that your teeth are too crowded and the accumulated plaque over the years leaves you at risk of developing gum disease (periodontitis). The solution for that is to have orthodontic treatment or dental braces to relieve the crowding. Once your teeth are straight you will be able to easily clean in between them and reduce the risk of developing gum disease. You can have fixed braces either metal or ceramic, Inman aligner or Invisalign to correct this. Short term braces such as six months smiles, Damon braces or quick straight teeth all are capable to fix this problem. We all are familiar with flossing and also the floss dance 😉 but not many know how to floss correctly and effectively. Technique: Break off about 30 cm of floss or tape and wind some around one finger of each hand, hold it tightly between your thumb and forefinger with about 4cm of floss between them, leaving no slack. Use a gentle rocking motion to guide the floss between your teeth. Do not jerk the floss or snap the floss into the gums. When it reaches the gum curve it into a C against one tooth and scrape the side of the tooth moving away from the gum. Repeat on the other side of the gap along the side of the other tooth. When flossing keep to a regular pattern. Start at one side of the mouth and go to the opposite side then move to the opposite arch and repeat. In this way you are unlikely to miss any teeth. Oral irrigators use a jet of water to force plaque and food debris away from your teeth. They are particularly useful if you have larger spaces between your teeth or are having orthodontic treatment and have brackets and wires on your teeth. They are also helpful to remove plaque from under fixed bridges and around crowns. They are also useful if you struggle to use interdental brushes. Examples of oral irrigators are waterpik and air floss. These are rechargeable and try to get one which is cordless for ease. If in doubt ask your dentist or hygienist. What will happen if I miss interdental cleaning? If food bits stay in between your teeth which a normal brush doesn’t remove, they will stay there and rot which can lead to dental caries and gum disease. If you visit your hygienist regularly then you might get away with missing it but not if you are too busy and find it hard to make appointments with your hygienist. If you have been diagnosed with gum disease then it’s an absolute must to use one of the methods mentioned above. That’ll keep the problem under control and also means less trips to the hygienist. Gum disease has active and passive phases so once it is treated and stabilised it can recur that is why it is important to stay on top of plaque control and interdental cleaning is the best way. Food debris and plaque remaining in between teeth is also a cause of embarrassing halitosis i.e. bad breath. Who wants bad breath? No one! so get those brushes and floss in there and have a clean mouth and a fresh breath to stay confident all day long.